The Coudersport Ice Mine is a cave near Sweden Township, Pa., that bears icicles in spring and summer but not in winter. A shaft about 12 feet long is located at the base of a steep hill. In winter, when the shaft is relatively dry, it fills with cold air. In the spring, snow begins to melt, and water accumulates at the bottom of the shaft. At the same time, cold air descends through rock crevices from higher in the hill, which focus it on this spot and freeze the water. By September this fund of cold air has been depleted, the ice melts, and the shaft is dry again when cold weather arrives. 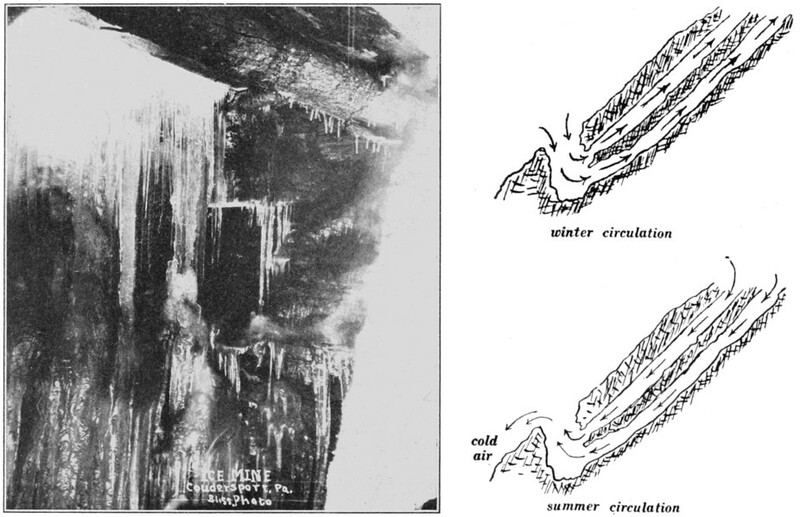 “The general skepticism regarding the existence of this phenomenon has been illustrated many times of late and has furnished the people of Coudersport with an endless source of amusement,” noted the Popular Science Monthly in 1913. Patient H.M. went through experimental brain surgery in the 1950s to address a severe epileptic disorder. He emerged with a curiously compromised sense of smell: He could detect the presence and intensity of an odor, but he couldn’t consciously identify odors or remember them. He was unable to say whether two scents were the same or different, or to match one given scent to another. When asked to make conscious choices, he confused an odor’s quality with its intensity. And although he could name common objects using visual or tactile cues, he couldn’t identify them by smell. Morton calls this “odor deafness,” by analogy with the “word deafness” found in some stroke victims, who can read, write, and hear but can’t recognize spoken words. This raises an interesting philosophical question: Does H.M. have a sense of smell? If he can detect the presence of a scent and its intensity but can’t recognize it or distinguish it from others, is he smelling it? 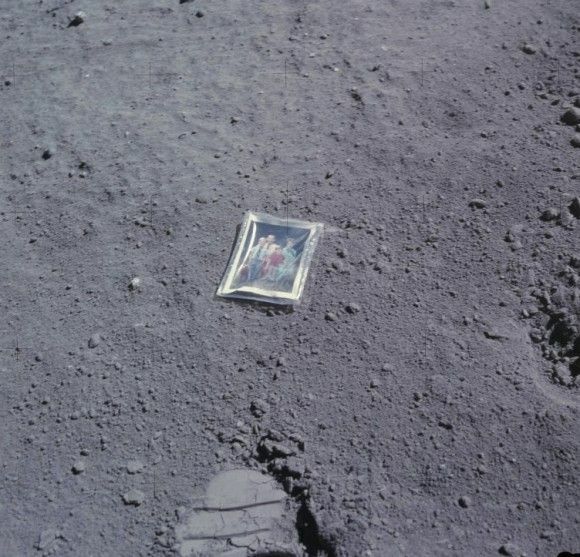 On April 23 Duke and John Young went exploring with the lunar rover in the Descartes Highlands, and he dropped the photo, wrapped in plastic, onto the surface and photographed it with his Hasselblad camera. 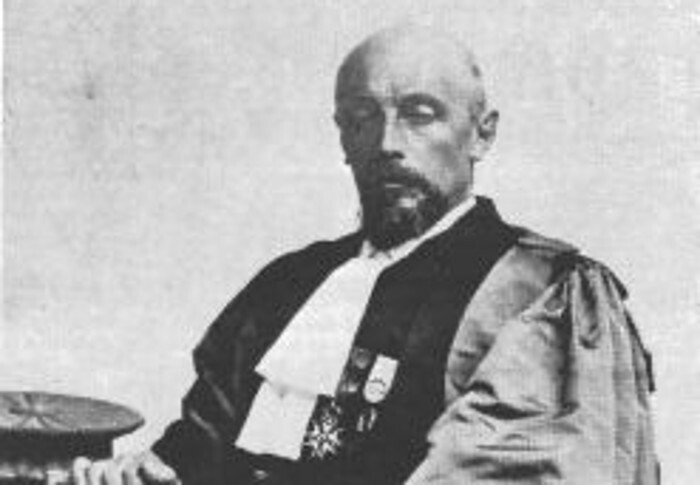 In 1903, French physicist Prosper-René Blondlot decided he had discovered a new form of radiation. But the mysterious rays had some exceedingly odd properties, and scientists in other countries had trouble seeing them at all. 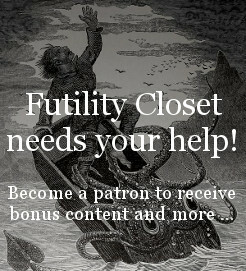 In this week’s episode of the Futility Closet podcast we’ll tell the story of N-rays, a cautionary tale of self-deception. We’ll also recount another appalling marathon and puzzle over a worthless package. The correct answers are 5 cents, 5 minutes, and 47 days, but each question also invites a quick, intuitive response that’s wrong. In order to succeed, you have to suppress your “gut” response and reflect on your own cognition deeply enough to see the error. Psychologist Shane Frederick devised the three-question test in 2005 to illustrate these two modes of thought, unreflective and reflective, which he called System 1 and System 2. Scores on the CRT correlate with various measures of intelligence, patience, and deliberation, but cognitive ability alone isn’t strongly correlated with CRT scores: If you’re not disposed to answer impulsively then the problems aren’t hard, and if you do answer impulsively then cognitive ability won’t help you. A sample of students at MIT averaged 2.18 correct answers, Princeton 1.63, Carnegie Mellon 1.51, Harvard 1.43; see the link below for more. So many more men seem to say that they may soon try to stay at home so as to see or hear the same one man try to meet the team on the moon as he has at the other ten tests. Apparently this appeared in the Journal of Recreational Mathematics in 1972; I found the reference in the April 1983 issue of Crux Mathematicorum, which confirmed (by computer) that the solution is unique. 1. Choose two random points on the circle and join them, then rotate the triangle until one of its vertices coincides with one of these points. Now the chord is longer than a side of the triangle when its farther end falls on the arc between the other two vertices of the triangle. That arc is one third of the total circumference of the circle, so by this argument the probability is 1/3. 2. Choose a radius of the circle, choose a point on that radius, and draw a chord through that point that’s perpendicular to the radius. Now imagine rotating the triangle so that one of its sides also intersects the radius perpendicularly. Our chord will be longer than a side of the triangle if the point we chose is closer to the circle’s center than the point where the triangle’s side intersects the radius. The triangle’s side bisects the radius, so by this argument the probability is 1/2. 3. Choose a point anywhere in the circle and draw the chord for which this is the midpoint. 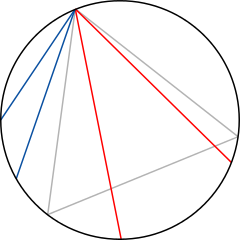 This chord will be longer than a side of the triangle if the point we chose falls within a concentric circle whose radius is half the radius of the larger circle. 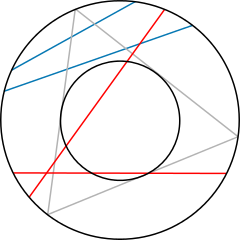 That smaller circle has one-fourth the area of the larger circle, so by this argument the probability is 1/4. Further methods yield still further solutions. 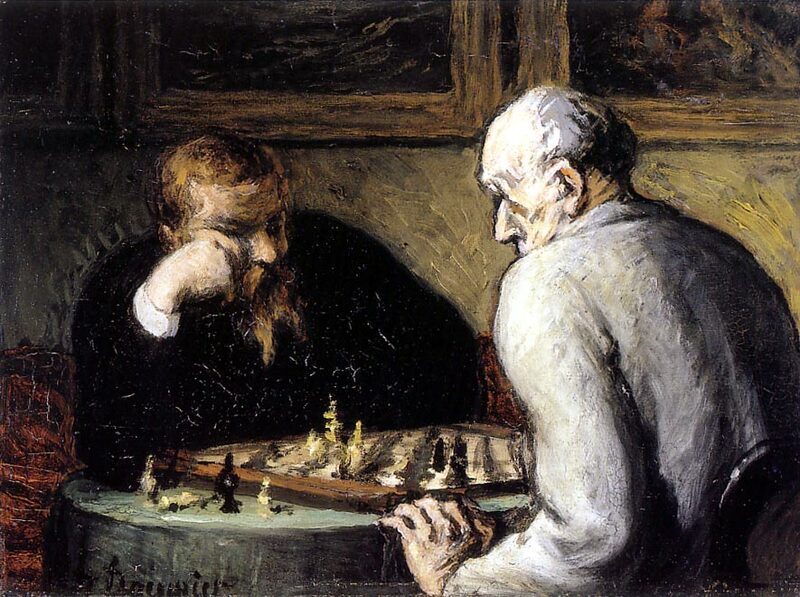 After more than a century, the implications of Bertrand’s conundrum are still being discussed. What is the shape of the moon’s path around the sun? The moon orbits the earth, and the earth orbits the sun, so many of us imagine it looks something like the image on the left, a looping motion in which the moon periodically slides “backward” during its progress around the larger body. 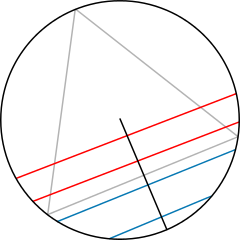 From the prolifically interesting Catriona Shearer: The red line is perpendicular to the bases of the three semicircles. What’s the total area shaded in yellow? At first it appears there’s not enough information, but there is! 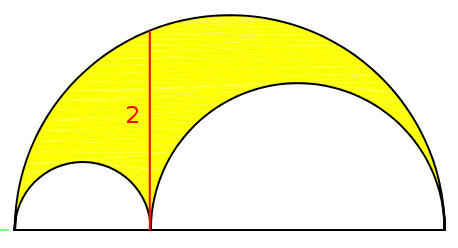 No matter the relative sizes of the two smaller semicircles, the area of the shaded region is π. There are any number of ways of proving this; here’s a pretty “proof without words” that relies on the fact that the Pythagorean theorem works with similar figures of any shape (here, semicircles).